The last of the browns, first of the rainbows? 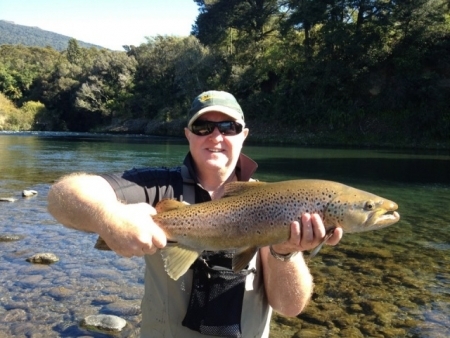 I have been out and about on a few of the rivers around Taupo on Saturday and Sunday with great kiwi clients. Saturday was an early start on the Tongariro with Stan from Wellington so we ensured we had first lines through the Stag which paid off for us pretty quickly. We spent most of the morning thumping this pool as it was giving up a fish often enough for us to hang around plus there were plenty of cars coming and going to all other easy access pools. It was a truly amazing morning with wonderful warm sunny periods and notÂ a breath of air. The river is very low and now has developed a slimy bottom so a good rain and flood is in order for this river currently especially to trigger some fresh run fish into the system.Â After landing three ok rainbows and loosing a good brown we ventured slightly up river and fished the Silly pool whichÂ I have not looked at for quite sometime. This piece of water looks very good at the moment andÂ offers some lovely deep drifts to nymph fisherman. Stan fished a smallÂ Green Caddis all morning and dragged another older jack out of the deep hole in the Silly pool to finish of a pretty good Saturday morning. There hasÂ been quite a fewÂ browns still getting caught in the TongariroÂ especially by night fisheman but there numbers are slowing down. I spotted about 12 browns over the weekend and caught one fish on Sunday afternoon from Cattle Rustlers with Richard using a heavy nymphing rig. This may have been the last brown for the season I think as what is there now seems pretty spooky and shy, especially on bright weekends like we just had.Â As you can see this was a worthy fish of a picture and weighed about 6lb before he was released again to catch his breath.Â Richard had quite a hard day yesterday with his son and between them I could only find 3 fish for them, again the Tongariro was busy with anglers in difficuilt conditions. River mouths are fishing well with the new moon phase and some good little bursts of trout have been going through the Waitahanui. I spoke to another guide yesterdayÂ and he reported catching a few fish using big glo bugs with his clients late on Sunday. I might pop down the rip this afternoon if the wind drops and heave and leave a glo bug of the lip-there are worst ways to spend an afternoon? ?